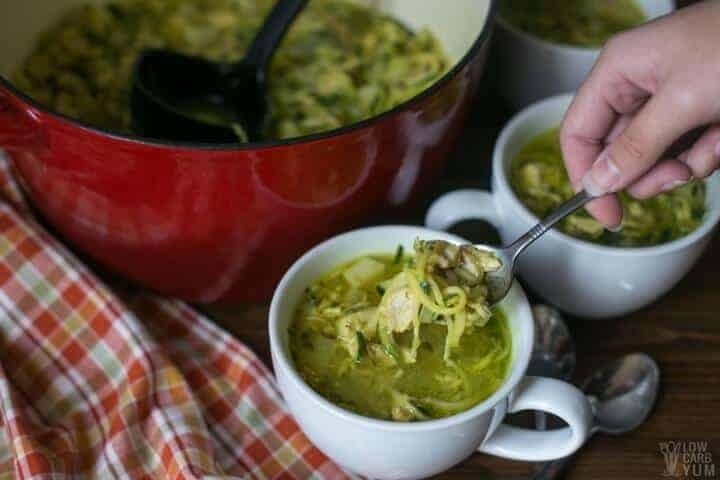 Spiralized zucchini replaces the usual pasta in this delicious keto low carb chicken noodle soup. 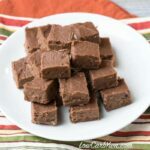 It’s an AIP paleo recipe that’s pure comfort in a bowl. 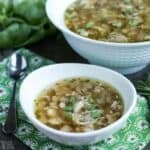 After making my Instant Pot bone broth, I knew that some soup was in order! 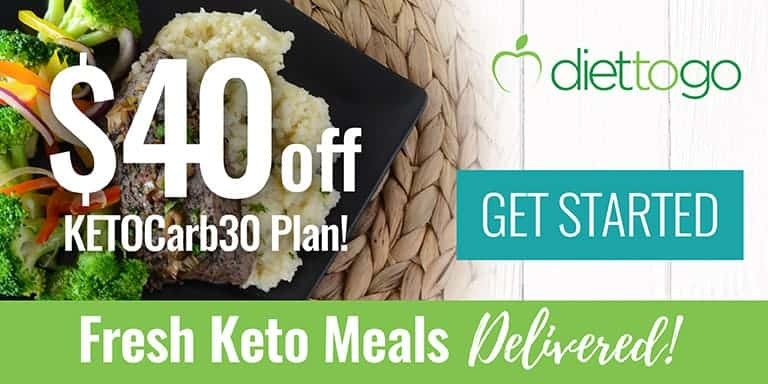 I’m still following an AIP diet to help calm my high immune activity so I needed something to fit that plan. I just finished reading The Autoimmune Solution book by Dr. Amy Myers. I loved the book so much that I’ve moved on to her book The Thyroid Connection. 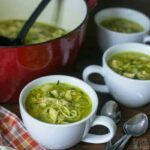 This gluten free low carb chicken noodle soup was inspired by a recipe in the Autoimmune Solution book. 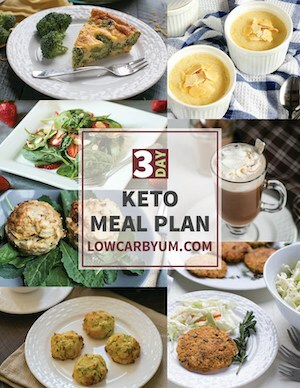 The information provided in the book is what convinced me to follow a 30 day AIP diet plan. 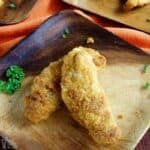 As I discuss in my profile, I moved to a low carb diet after having my thyroid ablated (destroyed by Iodine-131 radiation) due to Graves’ Disease. After most of my thyroid died off, I became hypothyroid and gained weight quickly. If I had known what I know now, I could have saved my thyroid. But, now that the damage is done, I at least need to address the root cause. And, eating the wrong foods seems to have played a major role in my thyroid disease. Recently, I discovered I have a severe sensitivity to egg whites. Unfortunately, eggs have been a huge part of my keto diet which likely aggrevated my autoimmune conditions. Nightshade vegetables and dairy probably didn’t help either. That’s why I’m following the strict AIP diet right now. 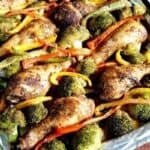 Thankfully, I can still make delicious meals made from whole foods that don’t contain any inflammatory ingredients. 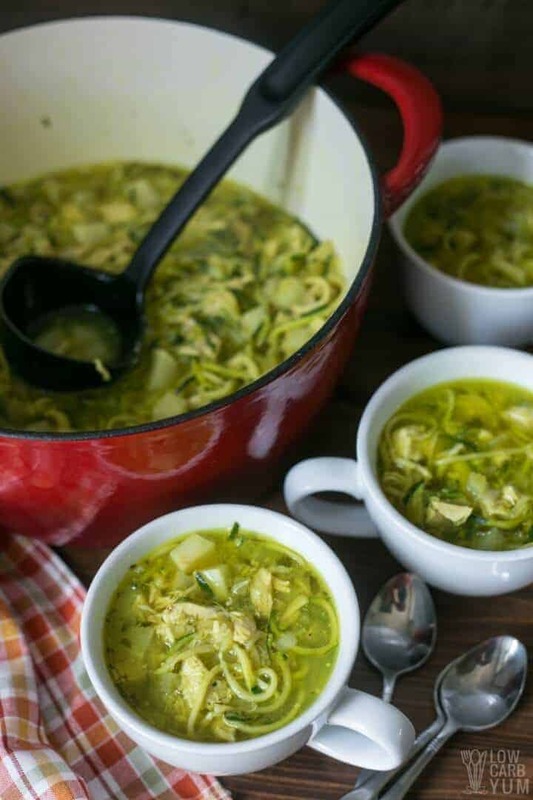 Just take a look at this yummy low carb chicken noodle soup! Because there was a lot of food cutting involved, I picked up a pound zucchini that was already spiralized. 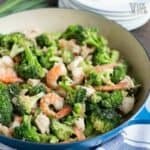 Usually, I’ll just whiz it through my spiralizer, but I wanted to save a few step with this recipe. How do I know I’ve got high immune activation? Earlier this year, I had a neurotransmitter test done. The levels of all my neurotransmitters tested were high which indicated that my immune system was overworking. I had tests done by a chiropractor who practices functional medicine. After showing high immune activation, I tested for gut permeability test and food sensitivities. My gut tested normal, but I discovered I was sensitive to things like egg whites, mushrooms, mung beans, potatoes, and corn. The only food on the sensitivity test that I have trouble eliminating are egg whites. However, after reading more about autoimmune diseases, I’m giving up egg whites for good. 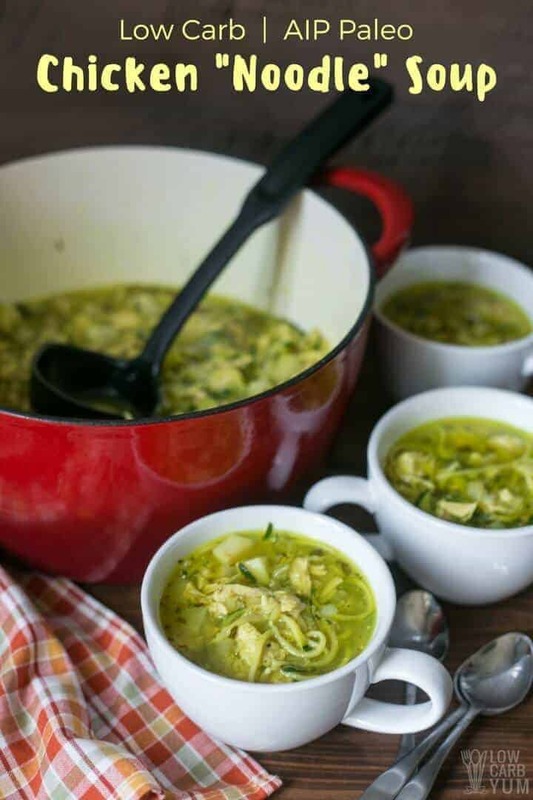 So, I’ll be enjoying more dishes like this simple low carb chicken noodle soup. I’ve been doing a lot of testing baking without egg whites. The best thing I’ve found so far is to use psyllium husks. Unfortunately, they come from a seed, so I’m avoiding psyllium while following the AIP plan. Not only do I have a thyroid disease triggered by an autoimmune condition, I’ve also got vitiligo. A couple years ago, I noticed a spot on my hand that would no longer tan. This year, I developed a similar white spot on my other hand. Vitiligo is another autoimmune disease. The pieces of the puzzle finally started coming together after reading about The Myer’s Way in The Autoimmune Solution book. Turns out I needed to do more than just eat a lower carb diet. 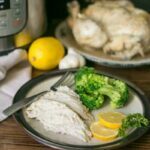 There are two foods Dr. Myers recommends eliminating if you have an autoimmune thyroid disease. One is gluten and the other is dairy. I was only halfway there since I gave up gluten years ago. 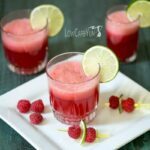 That’s why diary free recipes are likely to become the norm on this site. 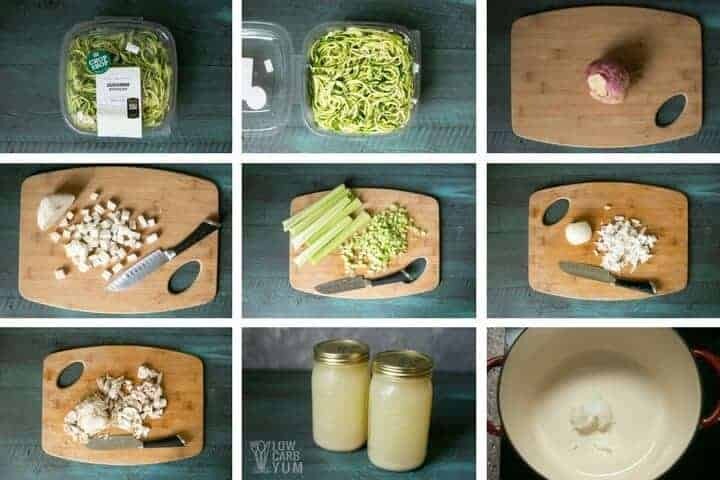 So, if you enjoy wholesome foods like this low carb chicken noodle soup, you’ll be happy that paleo friendly recipes like this one will be posted more often. I actually didn’t show any sensitivity to gluten or dairy when I was tested. However, gluten and the dairy protein casein have been shown to make thyroid conditions worse. If you happen to be one of the growing number of people with a thyroid disease, I strongly recommend reading The Thyroid Connection. You can find the book on Amazon here. It even includes some tasty recipes. 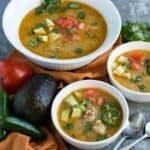 The fall season is when most people break out their low carb soup recipes. However, I like to enjoy these heartwarming recipes all year long. 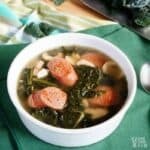 You can find even more recipes in my low carb soup and stew recipe round-up. 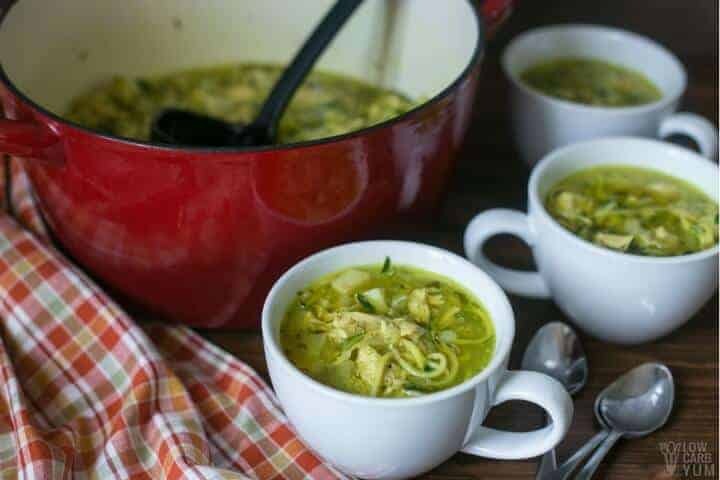 Spiralized zucchini replaces the usual pasta in this delicious keto friendly gluten free chicken noodle soup. 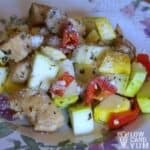 It's an AIP paleo recipe that's pure comfort in a bowl. Heat 1 tablespoon coconut oil over medium heat. 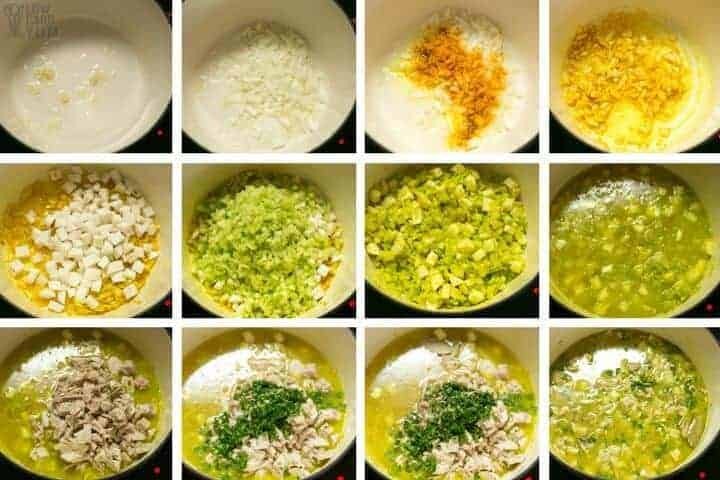 Add garlic and cook until fragrant. Add onions and turmeric. Cook until onion is translucent. Add turnip and celery with remaining 2 tablespoons of coconut oil. Sauté for about 10 minutes. Add broth, chicken, basil, parsley, salt, and bay leaves. Bring to a boil then reduce to a simmer. Cover, then simmer for about 40 minutes. Remove from heat. Remove bay leaves. Stir in the spiralized zucchini and cover the pot. Allow to sit for about 10 minutes to soften the zucchini noodles. Inspired by a Chicken Zoodle Recipe found in The Autoimmune Solution.